If you use box dyes to color your hair, how about trying out any of these ingredients that can lighten or darken your hair, naturally? Commercial hair products often contain a mixture of chemical ingredients that could potentially be harmful to your hair and scalp. The process of dying your hair using commercial product could result in damage that may be difficult to correct. Instead of having to worry about the potential for dry, brittle hair due to chemical hair treatments, consider making your own hair treatments. First, peel about five potatoes and place the peels in a bowl. You can cook the skinned potatoes—they will not be needed for this rinse. Pour two cups of water into a saucepan, along with the potato peels. Bring the potato peels and water to a boil. Lower the heat and simmer for about five minutes. 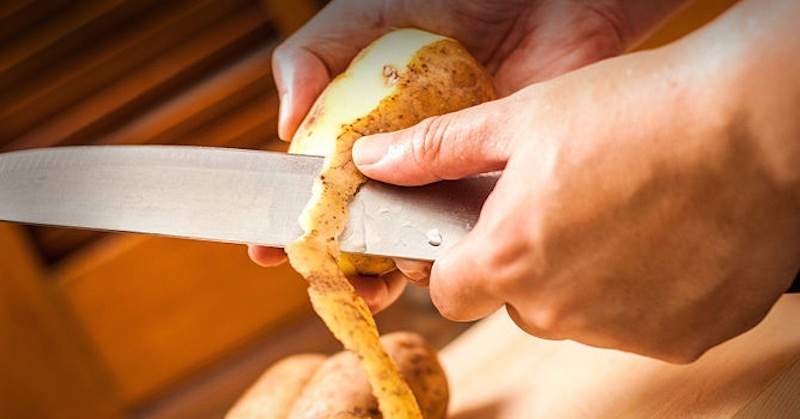 Remove from heat and allow the potato peels to completely cool. Strain the liquid, but save it. Add a few drops of rosemary or lavender essential oil to the liquid and then pour the mixture into a glass container. Use this mixture as a hair rinse after you shampoo your hair. Massage the potato peel water into your hair, but do not rinse it out. Repeat a few times after hair wash, until you get the desired shade. Henna is a powdered substance that comes from the leaves of a tropical shrub. While it is best known as a substance for creating temporary tattoos, it can also be used to dye your hair. Searching online, you can find various shades of henna, which can be used to hide grey hairs or darken your light hair. Make sure that you compare different shades of henna before choosing the right one. For a much better and permanent result, eat foods that reverse graying hair. This is a simple, yet effective way to add light streaks to your hair without spending any money—other than the cost of a lemon. Squeeze some fresh lemon juice into a spray bottle. Add water, so that you have about 3 parts water to one part lemon juice. Spritz your hair with the lemon water and then head outside. The combination of the sunshine and the naturally bleaching properties of the lemon will lighten your hair. Chamomile can also be used as a hair lightener. Brew a cup of chamomile tea and allow it to completely cool. Rinse your hair with the tea, after you have used your shampoo and conditioner in the shower. Honey is another natural ingredient that can be used to lighten your hair. It contains enzyme peroxide, which is known as an effective lightener when combined with distilled water. The water will activate the properties of the enzyme, to help lighten your hair. After shampooing your hair, massage a small amount of raw honey into your hair where you want it lighten. Allow it to dry and repeat for several days to begin lightening your hair. Obviously, not all commercial hair treatments are going to damage your hair, but there is a growing trend to turn to natural remedies for all types of health and beauty issues. Part of this is due to the uncertainty that comes with purchasing commercial products—along with their cost.